The TempVars collection has the ability to save developers time, improve the reliability of your programming and provide you with new ways to share information across your application. TempVars were introduced starting in Access 2007 and represented a major addition to the arsenal of tools for professional developers. With it developers can now store their global variables in a stable environment that will retain values regardless of program crashes. Before TempVars developers had limited choices when using application wide variables: module level variables; hidden forms or tables. Their are drawbacks to each approach, with module variables being the worst since they initialize if your program encounters an error; losing their assigned values in the process. TempVars have no such limitation, they retain their values when your code encounters an error and can be used in Forms, Queries, Reports and code. You initialize them when your application starts and they disappear when your application terminates. In short, their a great way to share information across your program! Add Method: Use it to add variables to the collection, all variables are of the variant type. All three methods above would return “Test Application”. Use this method to remove the variable or use RemoveAll to get rid of all of them. One particular advantage of using TempVars is their availability in queries, which you can’t do with global variables without using a function. I created an entire multi-franchise database system using TempVars to differentiate between franchisee data, it made my life easier and improved the reliability of my application. I encourage you to start using TempVars in your code and your queries in place of module variables or classes, providing your users with a better experience and making your code more powerful. I’m new to Access and learning VBA as well. I have a form (in DATASHEET MODE) that the users will paste multiple records into (from an excel sheet). I need to validate a specific field in the data that they paste before writing it out to a table. I need to make sure the IDs they enter, are valid (by comparing it to a ID field in a tblMembers on sql server). If the ID is available in that said tblMembers, they allow the writing out to occur, else return the IDs that are not valid. Is this possible using tempvars (for each of the rows they enter)….I’ve researched a lot, and most ppl suggest recordsets. I do not have any knowledge of recordsets and I’m on a time crunch now. The wildcard character differs depending on some ANSI SQL related setting. At least in our environment, a default ACCESS 2010 installation we need to use ‘%” for wildcard. I greatfull for the Ctrl-G tip above but cannot find a way to add TempVars there. How does one do that in that interface? Note that when using ANSI SQL-92 metacharacters (e.g. “%”), Access will use “ALIKE”, not “LIKE” function. When you set a database to use SQL-92, any new queries will default to “ALIKE” and change “LIKE” to “ALIKE”. But you can use the ALIKE even in a database without setting it to SQL-92 mode. I’m trying to create a little database and then reporting for it. I’m a novice to Access and have a question if that’s ok. I then need to select a field from one of the imported lines and copy it into another field for all the imported lines. I’ve tried all sorts of arguments using all sorts of syntax, by directly typing them in to the condition column or using the generator with no success, can you please give me the right syntax. my condition being: fieldb’s first character must be an A. I’m not sure if i can use where. To make things simplier, my version of access is in french so some of the language varies. Does a site or guide explaining access with simplistic examples for neophytes like me exist? Juan – Thanks for posting this info. Question though. In a multiuser environment, are TempVars specific to the user, or to the application? 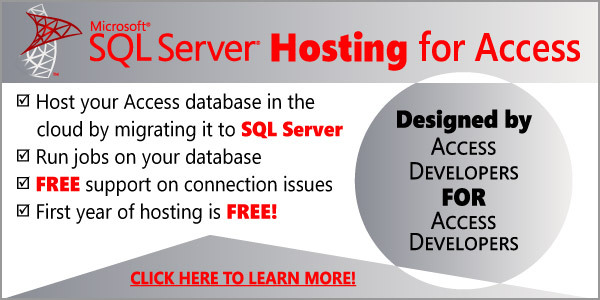 Example: I have a front-end access 2007 db linked to SQL tables. I do not require a “login” to the FE, but rather load their UserName and MachineName into Tempvars, which will serve to determine what they can and cannot see on certain forms. Will those tempvars remain for each instance of the FE, or will it be rewritten each time someone else opens the database? Hi Jaun, love your tempvars technique ! – hit a little glitch when executing a query (with tempvar criteria) thru the application object. Glad to hear you love the technique! Make sure the tempvars are populated before opening the query. Thanks Man, you are great. I was searching for this from last week. I haven’t used TempVars yet but after your post I think they have use in queries. Ugly name though: it suggest volatile storage, while they are global. The “stable environment” argument does not go very far for me: globals only reset while debugging, not in Production.